The first lake Wendouree aquafil Drinking Fountain has been opened at St Patrick’s Point. 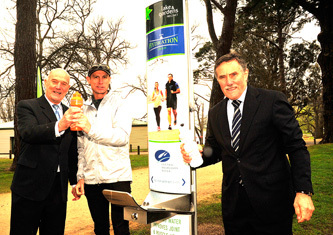 Central Highlands Water’s Chair Mr Jeremy Johnson and City of Ballarat Mayor Cr John Burt OAM officially opened the first of eight new drinking fountains on Friday at St Patrick’s Point as part of the Lake Wendouree Drinking Fountains project. Four new aquafil drinking water fountains featuring bottle refill dispensers, dog drinking bowls and wheelchair accessible bubblers and four replacement Furphy drinking fountains will be installed at various intervals along the Steve Moneghetti track. The drinking water fountains project is the result of a community partnership between Central Highlands Water and the City of Ballarat to enhance Lake Wendouree. Mr Jeremy Johnson, Chair, Central Highlands Water says the commencement of this project signifies a strong partnership with an excellent result for the community. “The Lake is used by many people from runners, walkers, families and rowers and it is with great pleasure that we are going to provide fresh drinking water to these and many other Lake users,” Mr Johnson said. Mayor Cr John Burt OAM says the new drinking stations are sure to be welcomed by the community, especially during the summer months.